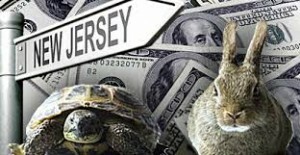 New Jersey online poker has been headed in the wrong direction now for months, and if May’s total revenues are any indication, that shouldn’t be expected to change anytime soon. According to the state’s Division of Gaming Enforcement (DGE), last month’s overall take from iPoker’s four card rooms yielded just $1,928,106, a 15.2 percent dip compared to May 2014, and 2.9 percent decline from April. While the numbers certainly paint a gloomy picture, the data suggests it could have been worse, with revenues from the Borgata and partypoker partnership outperforming estimates and likely saving New Jersey online poker from having its worst performing month since the market came to the Garden State in November of 2013. The WSOP and 888poker networks grossed $831,799, with Borgata and partypoker picking up the slack by bringing in $1,096,307. Though online poker revenues continue to struggle in New Jersey, iGaming as a whole is performing well, up more than 19 percent year-over-year and 12.6 percent for the 2015 campaign. So what is holding online poker back in New Jersey? There are many theories, and several potential solutions. First and foremost, player liquidity is of utmost concern, as active and bountiful tables are key for a successful poker room. The four sites in New Jersey also don’t currently offer the increasingly popular lottery Sit & Go format, a variant that has performed extraordinarily well around the globe for PokerStars and other leading poker networks. Critics of iPoker in Jersey also claim the marketing wasn’t up to par, and the rollout has hampered its long-term prosperity. But for anyone who lived in the state during and leading up to the debut of online gambling and iPoker knows how the Garden State Parkway’s billboards, New Jersey Transit rail cars and buses, and newspaper inserts were littered with advertisements announcing the news. Considering iPoker’s biggest month in the state came less than 60 days after legalization, it appears the marketing push was at least partially responsible for the early fruitfulness. The more likely culprit for online poker’s deterioration could be accredited towards initial geolocation issues and credit card authorization hiccups that prevented an untold amount of residents from joining in on the action, an audience that might not have ever been fully recovered. As several states currently deliberate online gaming legislation including Pennsylvania, the sixth-largest by population in America, the numbers from its neighbor might not be good news for residents in the Keystone State. However, with Internet gambling remaining healthy, lawmakers shouldn’t worry. That especially holds true should New Jersey finally welcome PokerStars into its jurisdiction, a move that has been long-expected but has gone long-unfulfilled. That would be a welcomed boost to online poker in New Jersey, and potentially the entire country should the state finally agree to an interstate compact like Delaware and Nevada’s pool sharing agreement announced in March.